Wow!! I love to Blog. I started baking in the early 70's. And my granddaughters love them. Since I only have Roosters and Chickens in my Barnyard. 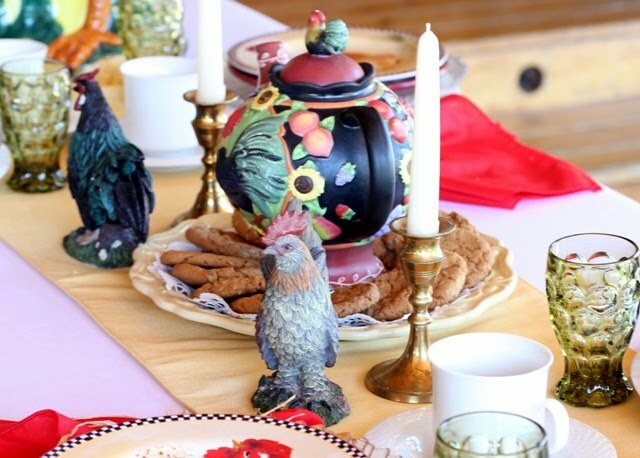 The hen house has invited us to have some Tea and Cookies. In a previous post, I shared my Kitchen Icon. Mr. Rooster. 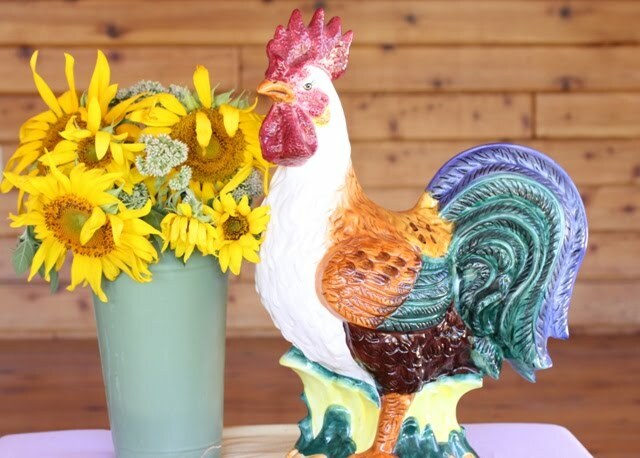 In any French kitchen the first thing you are likely to see is a brightly colored rooster. Yes, My Rooster does have bright colors. I would like to introduce you to Mr. Cream and Mrs. Sugar. I think they are very cute. This rooster looks like he owns the chicken coop. How about his attitude? tea pots? And, of course 'Butterscotch Delight' cookies to delight you. 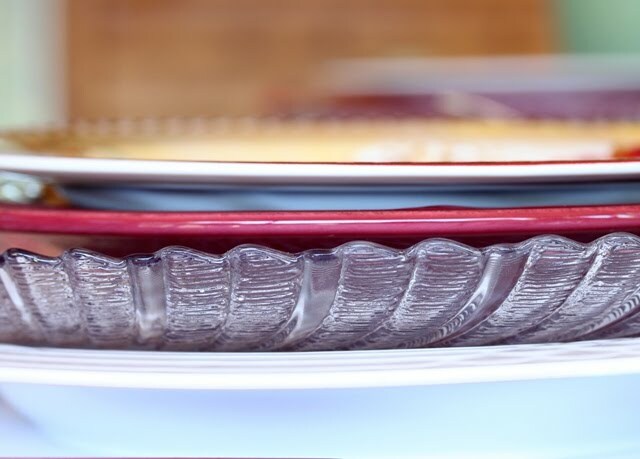 Each place setting has a White plate-my everyday, clear plate-church sale and a nice deep reddish purple plate-Bimore. 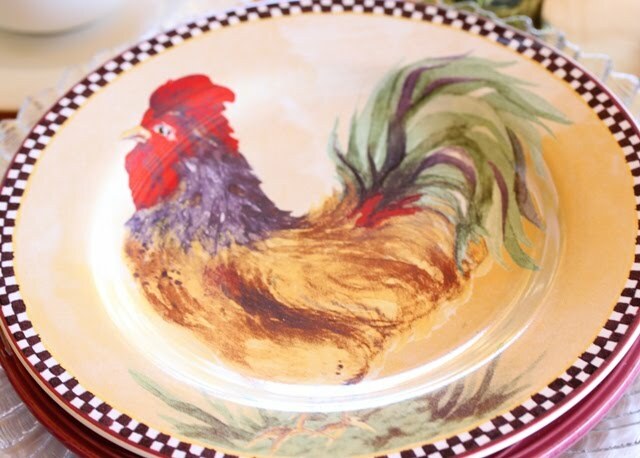 And a painted rooster on the top plate each representing a different breed of bird-gift from my dear sister. 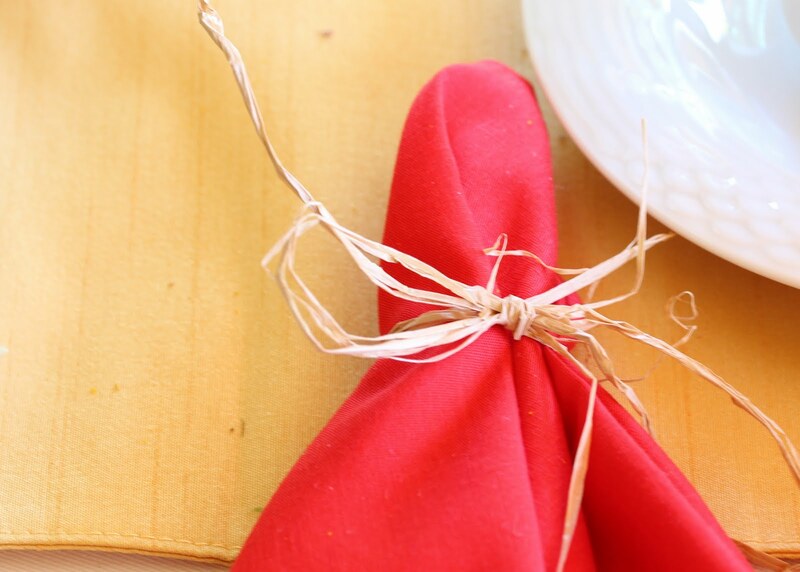 How about a little straw for the napkin rings? Everyone is ready for Tea and Cookies. The tea cups are waiting- same everyday dinnerware. My Sunflowers just started to bloom this week. They are so tall and beautiful. I was so excited to show their big yellow heads for Tablescape #7. Please join me for some Butterscotch Delights. Before zip lock bags, I would fill bread bags and freeze them. I always had cookies on hand for a lunch box, tea party or after school snack. Another wonderful party at My Cozy Corner is over. I love having parties. Thank you so much for visiting. Beautiful! I love all your roosters! So pretty! 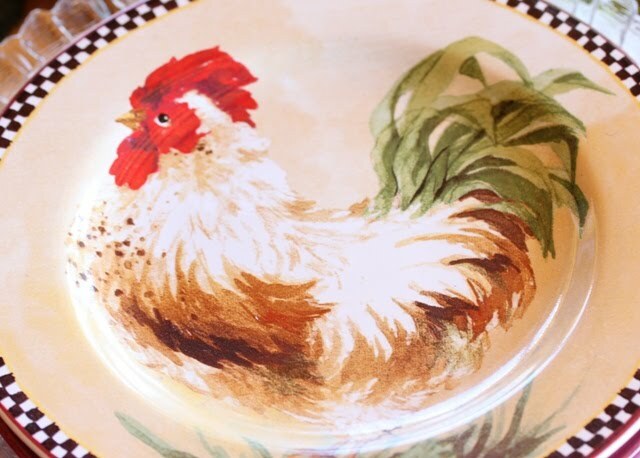 I absolutely love your rooster plates! So glad you showed us each plate. I also love how they have the black checked trim. 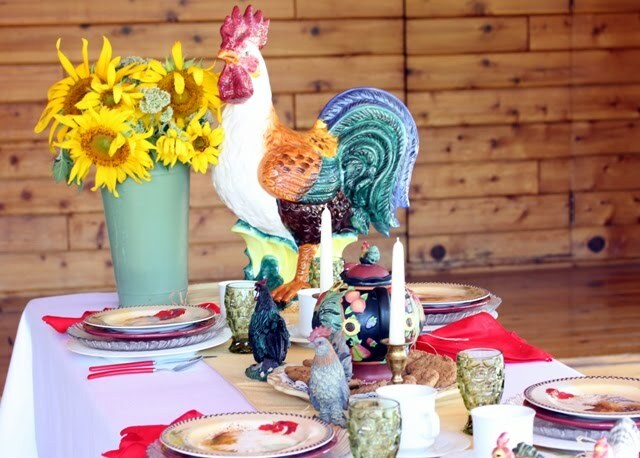 I am joining your from both Tablescape Thursday and the Barnyard Bash also. I just love roosters! Yours are exquisite! Thanks for visiting me that I might find you! I love all your roosters! The tea pot is adorable. Cute that you wrapped the napkins with raffia! Cute roosters. Love the plates. The recipe sounds yummy! You are just too much. I really enjoyed looking at all your blogs today. Of course I especially liked the violin case. How did you know all that about our dad? I never knew about the jam sessions, or when he started playing the violin. You're just so smart and savvy. Thanks for the lovely "hen" party! The table and the flowers are beautiful, and the cookies are delicious! Oh what a wonderful barnyard collection of roosters you have. I love those pretty plates and all that layering. All very delightful. Great tablescape! I love sunflowers, too. It is fun to compare all the barnyard tables - each one special and unique. 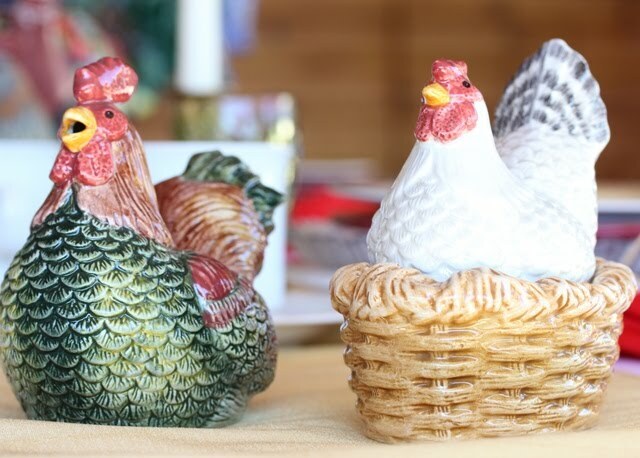 You have a gorgeous collection of roosters! A virtual rooster house. I'm wild over your dishes! The hand painted roosters are done so beautifully. So many treasures! Your sunflowers are just gorgeous! I love all your roosters!! I have a rooster theme on top of my kitchen cabinets!! 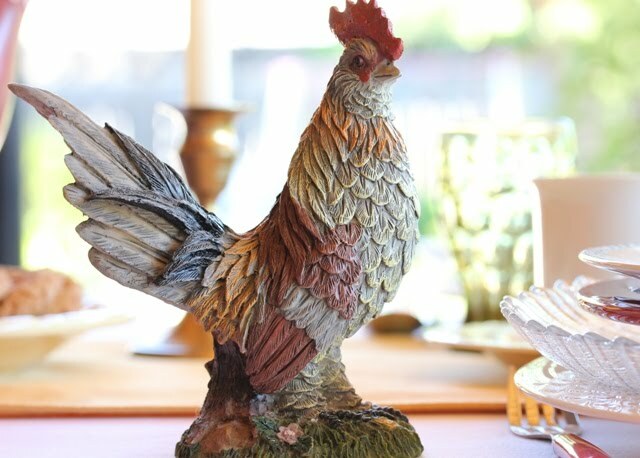 Great rooster collection..why is it we like chickens. I was raied on a farm and I've had a nasty old rooster chase me a time or two. Such a pretty and colorful table!!! Great tablescape!!!! What a beautiful table, love the aded touches. And educational plates! Oh I love your tablescape! Oh, what a party. Your roosters and hens are beautiful. 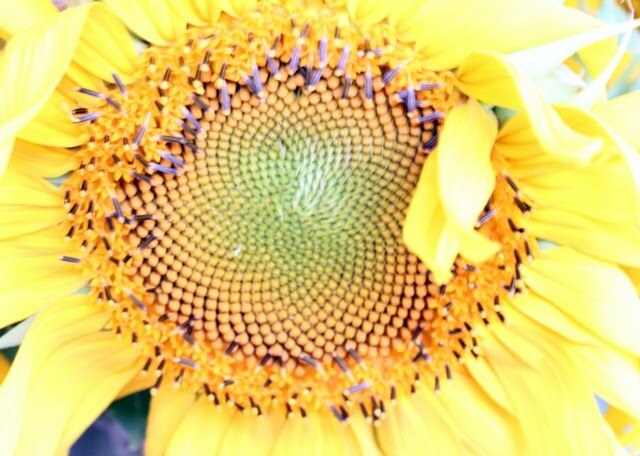 Love the sunflower and the delicious recipe you shared. 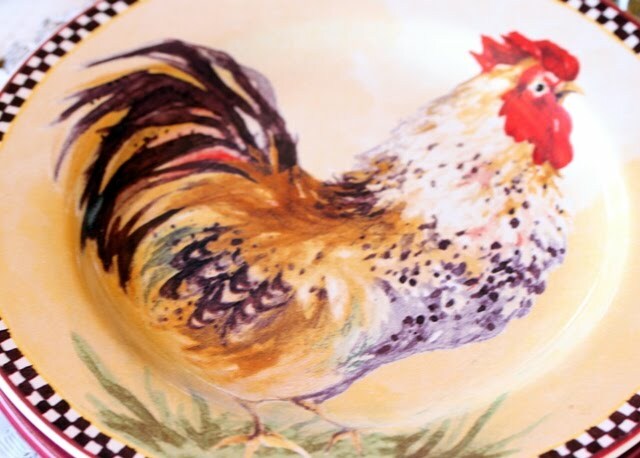 Love your rooster tablescape! 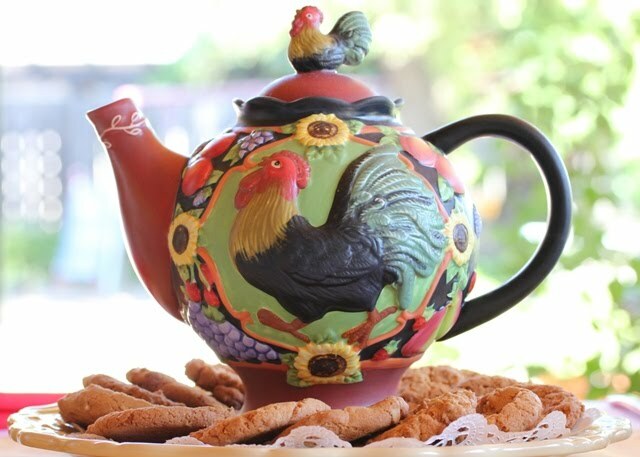 I like the rooster teapot the best. 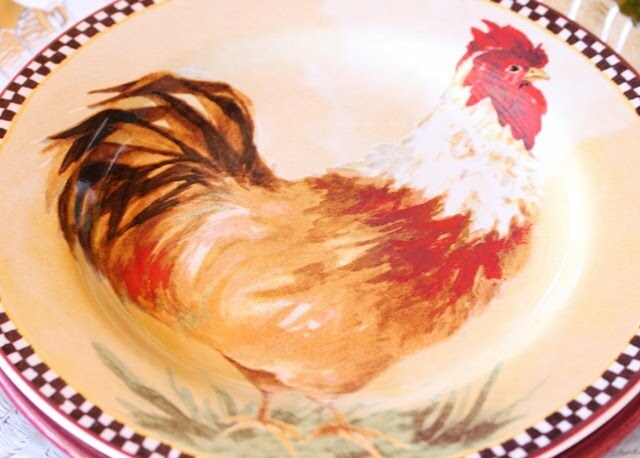 The rooster plates are cute, too. Happy Tablescaping!